I am an existing taxpayer registered under Excise, Service Tax and State Tax Laws such as VAT, Entry Tax, Luxury Tax and Entertainment Tax. I received SMS / E-Mail with Provisional ID and Password. What are next steps for me? How do I begin to enrol with the GST Common Portal with Provisional ID and Password? 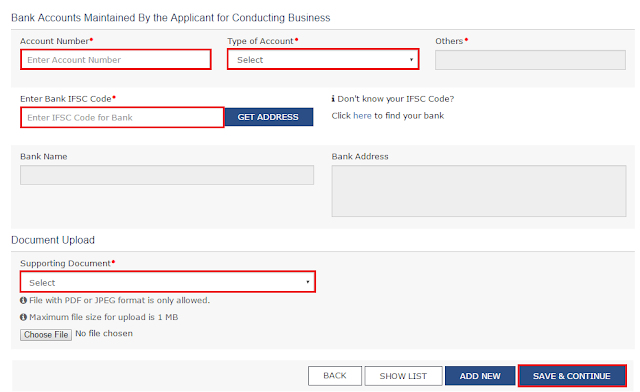 Business Bank account No, Type of account, IFSC code. 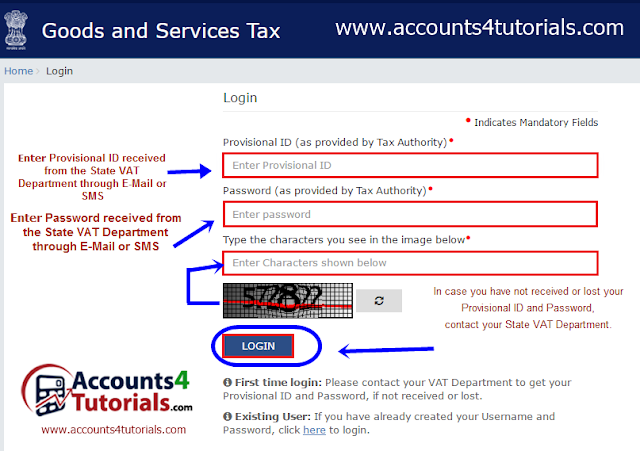 All existing taxpayers and VAT dealers will be given a provisional ID and a password. 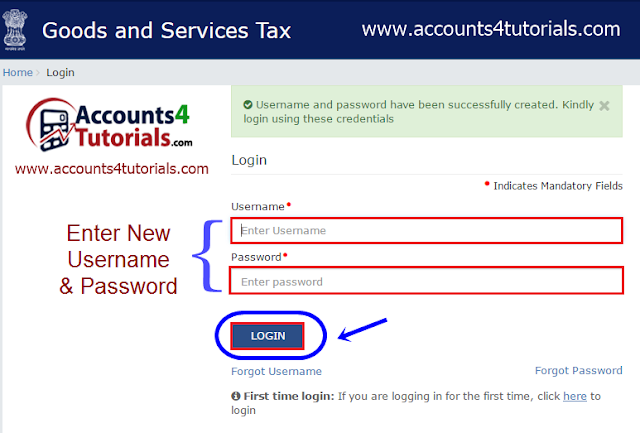 You first need to create your username and password using this provisional ID and password at the GST Common Portal - www.gst.gov.in. It is assumed that all existing Central Excise taxpayers are already registered under State VAT Department. It covers both Central Excise and State VAT registration. > Access the www.gst.gov.in. The GST Home page is displayed. > Click the NEW USER LOGIN button. > The Login page is displayed. 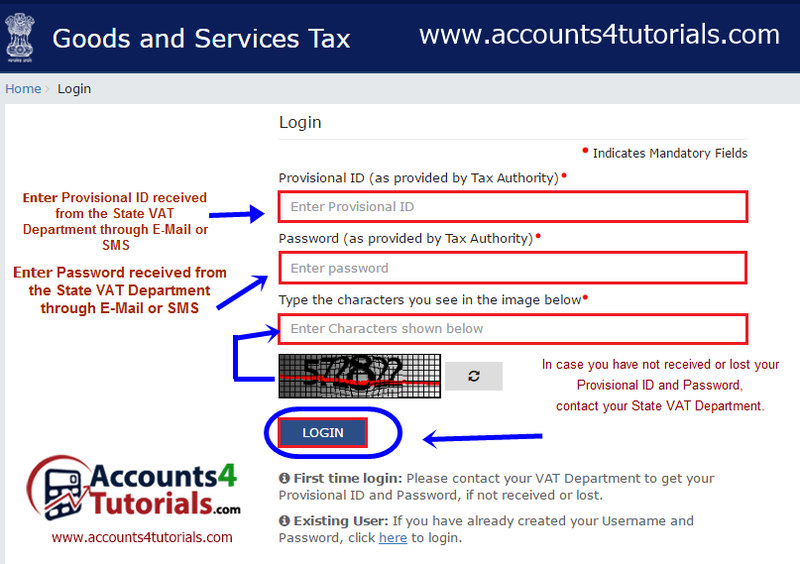 In the Provisional ID & Password field, type the username that you received in the e-mail, SMS or any other communication received from the State VAT Department. > In the Type the characters you see in the image below field, type the captcha text as shown in the screen. > Click the LOGIN button. 1. In case you have not received or lost your Provisional ID and Password, contact your State VAT Department. 2. In case you have already created your username, click the here link to login. > The Provisional ID Verification page is displayed. In the E-mail Address field, enter your e-mail address. 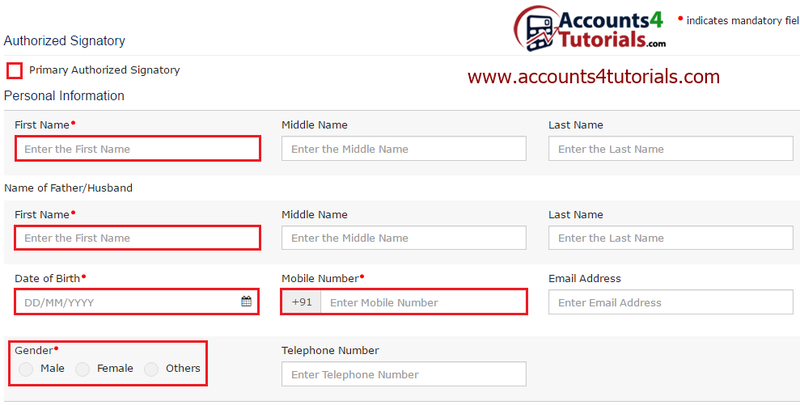 > In the Mobile Number field, enter your valid Indian mobile number. > Click the CONTINUE button. > Enter your own e-mail address and mobile number if you are the Primary Authorized Signatory. 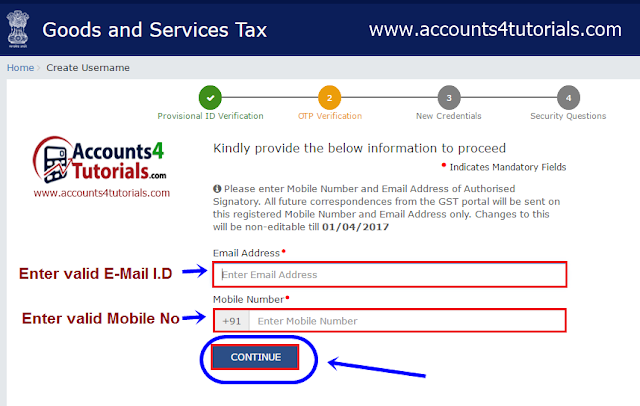 All future correspondences from the GST Common Portal will be sent on this registered e-mail address and mobile number only. > E-mail address and mobile number cannot be changed till 01/04/2017. 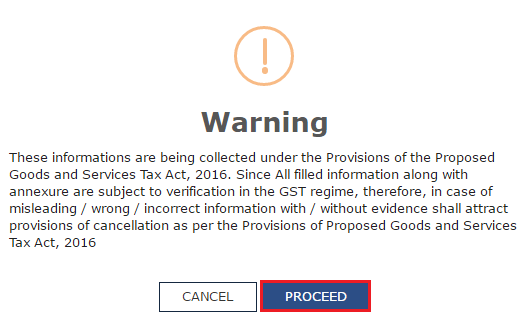 > Any change in the registered e-mail address and mobile number can be done through the amendment process after 01/04/2017 as specified in the GST Act. > The OTP Verification page is displayed. 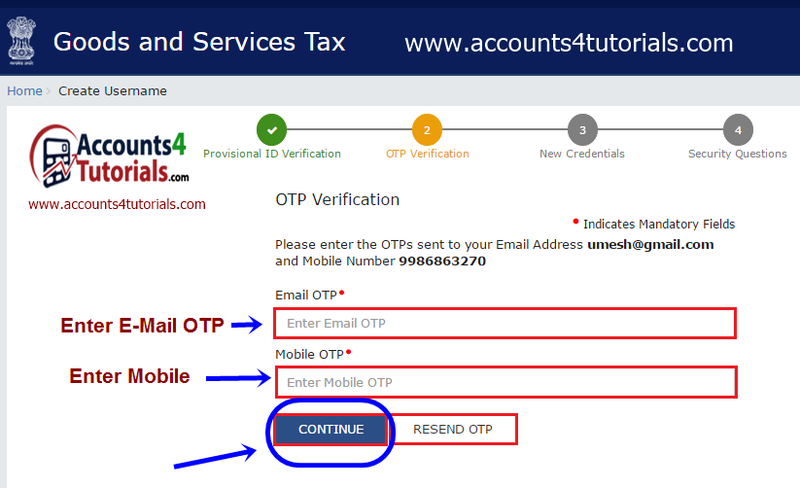 In the Email OTP field, enter the OTP you received in your e-mail address. > In the Mobile OTP field, enter the OTP you received on your mobile phone. > The New Credentials page is displayed. In the New Username field, enter a username for yourself. > In the Re-confirm Password field, reenter the password. > Username should be of 8 to 15 characters, which should comprise of alphabets, numbers and can contain special character (dot (. ), underscore (_) or hyphen (-)). > Password should be of 8 to 15 characters, which should comprise at least one alphabet, one number, one upper case letter, one lower case letter and one special character. > The Security Questions page is displayed. 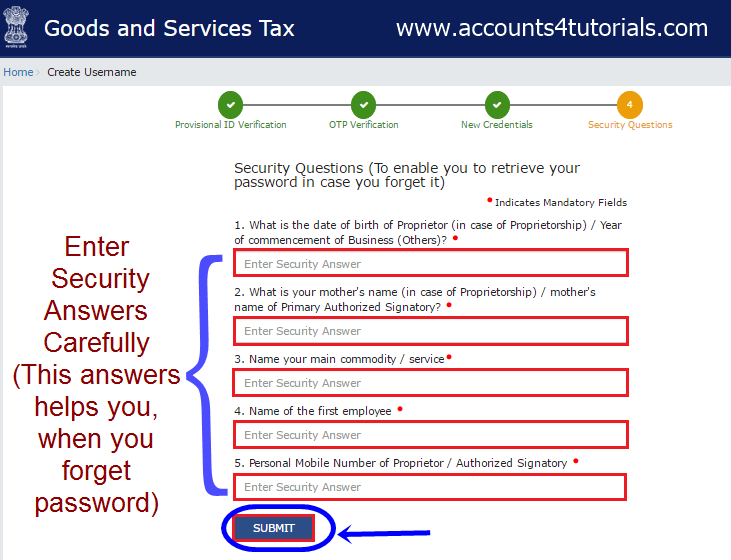 For each security question, enter the answers. > Click the SUBMIT button. > The message “Username and password have been successfully changed. Kindly login using these credentials” is displayed. 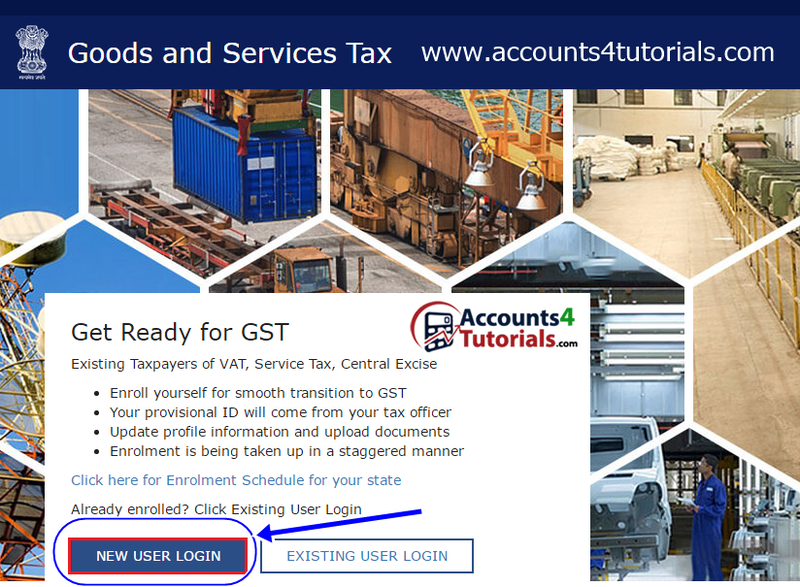 You can now login to the GST Common Portal using the username and password you just created. > In the Username field, enter the username you just created. > In the Password field, enter the password you just created. > In the Type the characters you see in the image below field, type the captcha text as shown on the screen. > The Welcome page is displayed. Click the CONTINUE button. > Your Dashboard is displayed. > The Business Details tab is selected by default. This tab displays the information to be filled for the business details required for enrolment. In the First Name field, enter the first name of the stakeholder. In the Middle Name field, enter the middle name of the stakeholder. In the Last Name field, enter the last name of the stakeholder. Under the Name of Father/Husband, in the First Name field, enter the first name of the father of the stakeholder. Under the Name of Father/Husband, in the Middle Name field, enter the middle name of the father of the stakeholder. Under the Name of Father/Husband, in the Last Name field, enter the last name of the father of the stakeholder. Select the Date of Birth of the stakeholder using the calendar. 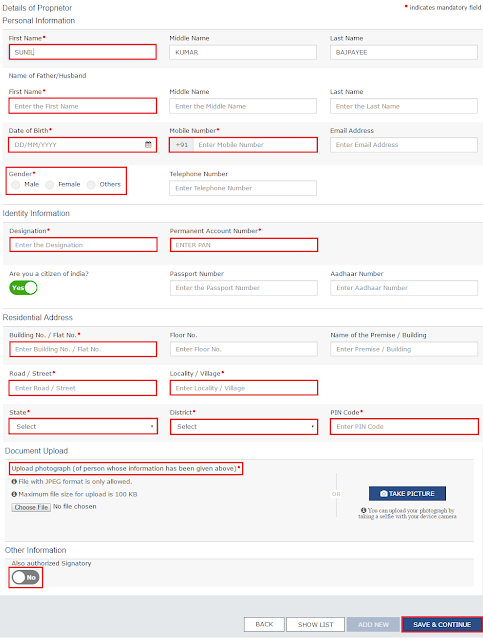 In the Mobile Number field, enter the valid Indian mobile number of the stakeholder. In the Email Address field, enter the valid e-mail address of the stakeholder. Select the Gender of the stakeholder. In the Designation field, enter the designation of the stakeholder. In the Permanent Account Number field, enter the Permanent Account Number (PAN) of the stakeholder. In the Aadhaar Number field, enter the Aadhaar Number of the stakeholder. In case you are a citizen of India, select Yes or else select No. In case of NO, in the Passport Number field, enter the passport number of the stakeholder. In the Building No. / Flat No. field, enter the building number and flat number of the residential address of the stakeholder. In the Floor No. field, enter the floor number of the residential address. In the Name of the Premise / Building field, enter the name of the building of the residential address. In the Road / Street field, enter the road name where the residential address is located. In the Locality / Village field, enter the locality or village name where the residential address is located. In the State drop-down list, select the State where the residential address is located. In the District drop-down list, select the city or district where the residential address is located. In the PIN Code field, enter the pin code of the place where the residential address is located. In the Document Upload section, click the Choose File button to add the photograph of the stakeholder. Navigate and select the document. In case you are the primary Authorized Signatory, select the checkbox for Primary Authorized Signatory. In the First Name field, enter the first name of the authorized signatory. Under the Name of Father/Husband, in the First Name field, enter the first name of the father of the authorized signatory. Under the Name of Father/Husband, in the Middle Name field, enter the middle name of the father of the authorized signatory. Under the Name of Father/Husband, in the Last Name field, enter the last name of the father of the authorized signatory. Select the Date of Birth of the authorized signatory using the calendar. 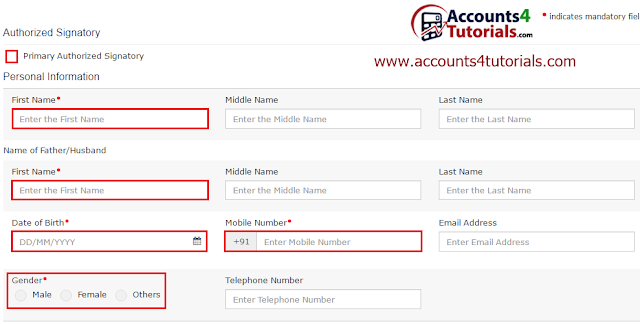 In the Mobile Number field, enter the valid Indian mobile number of the authorized signatory. In the Email Address field, enter the valid e-mail address of the authorized signatory. Select the Gender of the authorized signatory. In the Designation field, enter the designation of the authorized signatory. In the Permanent Account Number field, enter the Permanent Account Number (PAN) of the authorized signatory. In case of NO, in the Passport Number field, enter the passport number of the authorized signatory. 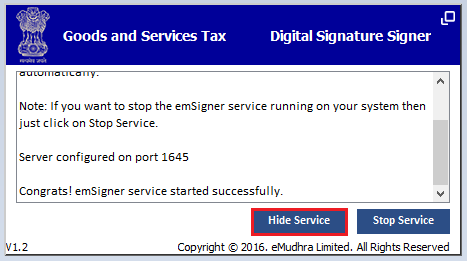 In the Aadhaar Number field, enter the Aadhaar Number of the authorized signatory. In the Building No. / Flat No. field, enter the building number and flat number of the residential address of the authorized signatory. In the Document Upload section, in the Proof of appointment of Authorized signatory drop-down list and Upload photograph, select the appropriate document to be uploaded. Click the Choose File button. Navigate and select the document. 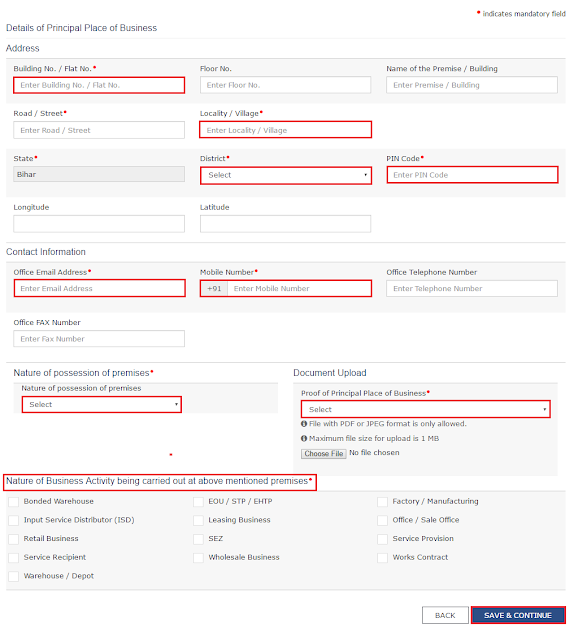 > >To add more details of any other authorized signatory, click the ADD NEW button. > To view the list of all the authorized signatories, click the SHOW LIST button. In the Building No. / Flat No. field, enter the building number and flat number of the principal place of your business. In the Floor No. field, enter the floor number of the principal place of your business. In the Name of the Premise / Building field, enter the name of the building of the principal place of your business. In the Road / Street field, enter the road name where the principal place of your business is located. In the Locality / Village field, enter the locality or village name where the principal place of your business is located. 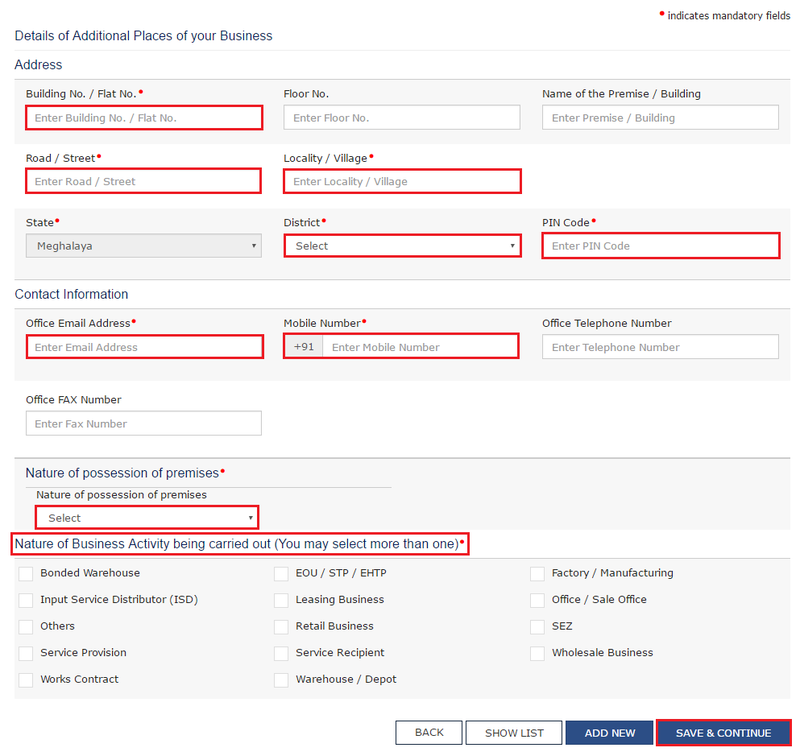 In the District drop-down list, select the city or district where the principal place of your business is located. In the PIN Code field, enter the pin code of the place where the principal place of your business is located. In the Office Email Address field, enter the official e-mail address used for business purpose. In the Mobile Number field, enter the official Indian mobile number used for business purpose. In the Office Telephone Number field, enter the official telephone number used for business purpose. In the Office FAX Number field, enter the official FAX number used for business purpose. In the Nature of possession of premises drop-down list, select the nature of possession of premises. In the Document Upload section, in the Proof of Principal Place of Business drop-down list, select the appropriate document to be uploaded. 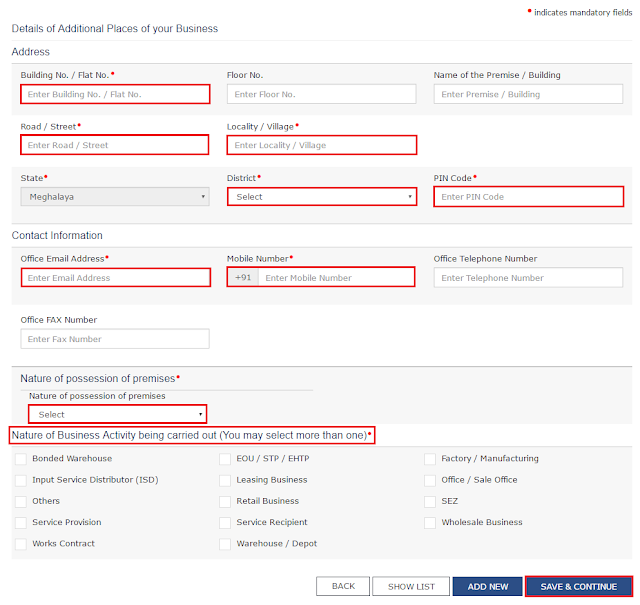 Select the checkbox for Nature of Business Activity being carried out at the premises whose details are entered here. > This tab page displays the details of the goods and services supplied by the business. 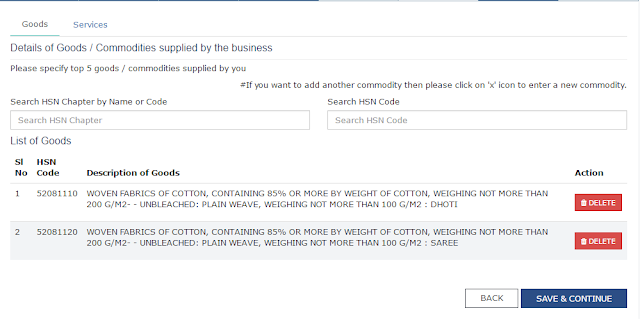 > In case you deal with Goods or Commodities, you need to mention the HSN Code in the Goods tab. In case you deal with services, you need to mention the SAC Code in the Services tab. You can add maximum 5 goods and 5 services. In case, you have more than 5 goods or services, you must add the top 5 goods or services you are dealing with. In the Search HSN Chapter by Name or Code field, enter the first four digit 6105 from the HSN Code. In the Search HSN Code field, enter the HSN code 61051010. HSN Code is successfully added. 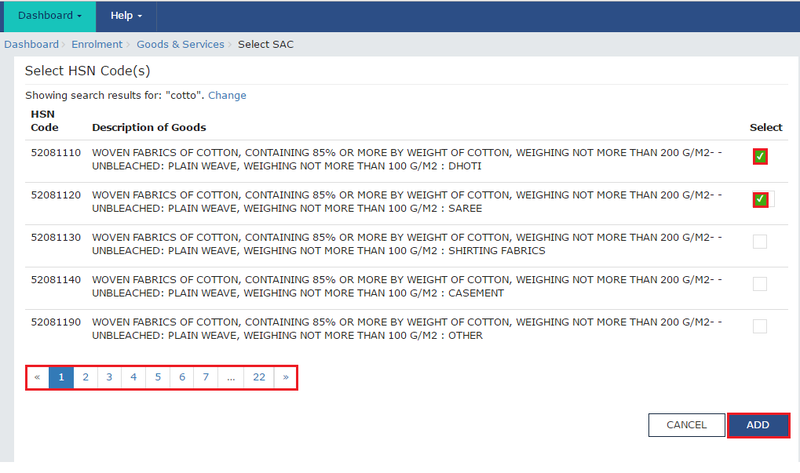 In the Search HSN Chapter by Name or Code field, type cotton; related HSN Chapter list is displayed. From the displayed list, scroll and select the appropriate option (in this case 5208). In the Search HSN Code field, again type cotton or 5208; related HSN Code list is displayed. From the displayed list, scroll and select the appropriate option. In case the appropriate option is not visible, scroll and select the View All link. Select the check boxes for HSN codes to be added. Scroll between the pages to select the appropriate option. Click the Add button. HSN Code is successfully added. In the Search by Name or Code field, type the name or the SAC Code of the services supplied by the business. SAC is successfully added. > In the Document Upload section, in the Supporting Document drop-down list, select the appropriate document to be uploaded. > Click the SAVE & CONTINUE button. In the Authorized Signatory drop-down list, select the name of the authorized signatory. In the Place field, enter the place of your principal place of business. After filling the enrolment application, you need to digitally sign the application using Digital Signature Certificate (DSC). Submission of application with the details is NOT completed unless DSC is affixed. In case you do not have DSC handy, you can save the application and decide to sign the application later. In such case, to save the Enrolment Application, click the SUBMIT button. 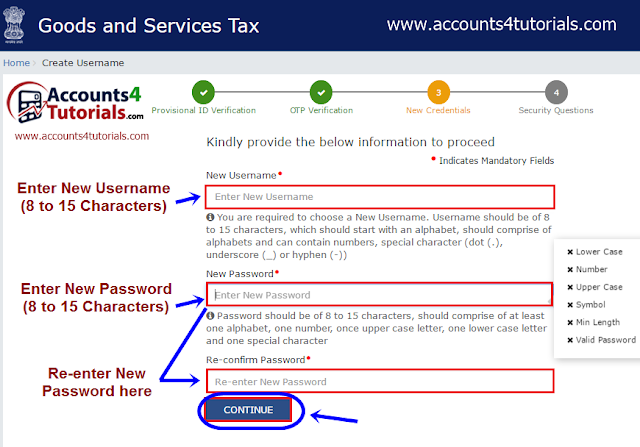 Click here to know more about how to access saved Enrolment Application and edit it. Click the SUBMIT WITH DSC button. In case, your DSC is not registered, you will need to register DSC. This information is really valuable and precise. I have read various blog post regarding GST but most of my doubts weren't cleared. Now all my GST related queries are resolved.